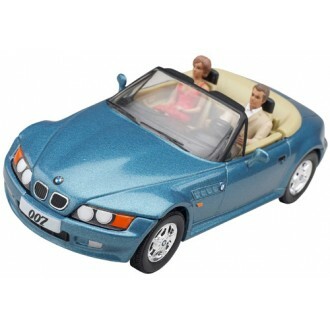 The model also comes with figures of Bond and Natalya Simonova. A sleek stylish convertible, Bond's BMW Z3 Roadster boasts concealed stinger missiles, parachute braking and self-destruct system. Shown in the film, Goldeneye, a year before the car became available on the open market, the publicity generated a huge amount of advance orders. This superb model is in 1:36 scale and working features include stinger missiles hidden behind the headlights.